Ice Age 3: Dawn of the Dinosaurs (2009). A few years ago I began an analysis of suspense and other narrative strategies in Blue Sky Studios’ Ice Age 3: Dawn of the Dinosaurs (2009, by Carlos Saldanha), as a follow-up study to my research on suspense in Alfred Hitchcock’s films (see Weibel 2008). We can briefly describe suspense as the confrontation of a sympathetic protagonist with a threat and low chances of defense (see Junkerjürgen 2002: 328). Most episodes in Ice Age 3 are dominated by different sorts of threats, and potential victims are often vulnerable protagonists, such as the highly pregnant Ellie or the clumsy Sid. As in classic thrillers, the story of Ice Age 3 is causally driven and focused on a final goal (see Pfister 1988: 104), unlike episodic slapstick films (see Gerbode 2004: 27). However, due to the genre’s typical indestructible protagonists and widespread comic reliefs, the intensity of suspense may generally be lower here. Also, in contrast to many thrillers, action sequences presenting a spectacle in Ice Age 3 seem to be more important than instrumental violence as the cause and propellant of the story (see Gerbode 2004: 14-15). Methodologically, my analysis was based on William Brewers and Edward Lichtensteins structural-affect theory of stories (see Brewer & Lichtenstein 1982: 473-486), which distinguishes between the narrative content at story level and the corresponding abstract narrative strategies at discourse level. At first, I identified all recognizable narrative strategies at discourse level and classified them in a nomenclature system. I included also all modified narrative strategies, such as the auctorial suspense (which we have when only the viewer sees the threat) or the surprise/suspense (which occurs when the threat begins unexpectedly). In order to visualize the flow and diversity of the narrative strategies, I graphically depicted their chronological position and degree of variation (fig. 2). In addition, I identified the number of narrative strategies per minute in each scene and compared the resulting data with the average of the whole film, as an indication of their relative narrative speed (fig. 3). In order to determine if there are differences in narrative density, I graphically mapped the simultaneous course of the narrative strategies and compared the number of parallel strategies with the mean value. Finally, I examined every narrative strategy for a possible recurrence, always considering the preceding strategy. Fig. 2. Distribution of the narrative strategies used in Ice Age 3 on the time axis. From this study has emerged that the suspense strategy is the quantitatively dominant narrative form of the entire film. Overall, the graphic representations show a relatively homogeneous distribution of the narrative strategies and their forms of variation (fig. 2). The changes in the average narrative speed corresponded to the differences in dramatic intensity at story level, such as the increased speed in particularly dramatic episodes in the last third of the film (see fig. 3). For instance, this is the case in scene 33, where Manni and Diego try to fend off the hungry Gualong dinosaurs on their way to Ellie, who lies in labour on a distant plateau. Interestingly, my expectations regarding the dominance of the three-phase sequences (start/interaction/end) were not confirmed, since the results showed a clear majority of sequences with only two phases (interaction/end or start/end). Furthermore, almost all elements of surprise appeared as functional parts of a narrative sequence, while completely independent surprises were very rare. Fig. 3. Narrative strategies per minute. The narrative structure in certain dramaturgically important scenes, such as the beginning or end of the film plot, showed a high variability of narrative elements, compared to the mean value. The average repetition rate of 6.5 % in the whole film seemed to be quite low and to correspond with a generally high proportion of variation forms. Contrary to my expectation of a simple sequence of narrative strategies, the data impressively shows that the vast majority of strategies run in parallel tracks. I found positive correlations between the speed of narrative strategies and the quantity of suspense strategies. This occurs, for example, in scenes with a high narrative speed and a high proportion of suspense (e.g. see scene 35, where Sid, drifting on a crumbling stone on the lava flow, desperately tries to escape the rapidly approaching lava fall). Here I found also a high number of two-phase sequences (fig. 4) with a low average sequence duration and a low average sequence density, caused by the fast and short binary interactions in the corresponding struggle sequences. For instance, this occurs in scene 25, where Buck tries to defeat the huge carnivorous plant that devoured Manni and Diego and until then repelled all attempts at liberation. Fig. 4. Suspense (blue) and two-phase sequences (red). Furthermore, I noticed that the patterns of fractal-like objects generally serve well as an illustration for the construction of suspense sequences. In short, fractals are defined as geometric objects constructed from ever smaller copies of themselves (see Mandelbrot 1987: 30), such as the fractal line, which consists of equal, but smaller lines (fig. 5). Fractal-like objects are very common in nature (e.g. the branches in the human lung, neurons or blood vessels) as well as in art (e.g. the golden section; see Zeitler & Pagon 2000: 146, 158). Likewise, global sequences in suspense structures are regularly composed of similar, but smaller macro-sequences, which in turn consist of even smaller micro-sequences, etc. (fig. 5). 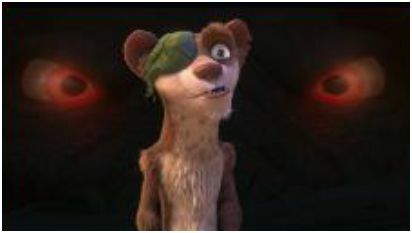 For example, in Ice Age 3 the global sequence for liberating the kidnapped Sid consists of several successful fights against antagonists, which in turn consist of many minor attacks and defensive measures within each fight. Fig. 5. Fractal line and narrative sequence structure. This approach may prove useful also in the investigation of possible connections between quantitative narrative parameters and audience success. For instance, the literary scholar Ralf Junkerjürgen discovered that Jules Verne’s commercially most successful novel Le Tour du monde en quatre-vingts jours (1873), with 16 suspense episodes measured against the average of seven episodes in all of Verne’s 54 travel novels, is also the most sophisticated in quantitative terms. In general, there may be much potential in establishing prospective analysis strategies to support the control of the quantitative profile of narrative structures during the process of story development. Adrian Weibel has been researching and writing on suspense and other narrative strategies in different film genres since 2006. His publications include Spannung bei Hitchcock. Zur Funktionsweise des auktorialen Suspense (Würzburg 2008) and Suspense im Animationsfilm. Grundlagen der quantitativen Spannungsanalyse. Studienbeispiel Ice Age 3, Bd. I-IV (Norderstedt 2018), which was presented at the 2018 FFK (Film- und Fernsehwissenschaftliches Kolloquium) at the University of Bochum, Germany. Brewer, W. F. and Lichtenstein, E. H. (1982). “Stories Are to Entertain. A Structural-affect Theory of Stories“, Journal of Pragmatics 6. Gerbode, D. (2004). Komik und Gewaltdarstellung. Distanzierende und dissonante Bedeutungs- und Gefühlsangebote in Filmtexten, Diplomarbeit, HFF „Konrad Wolf“ Potsdam-Babelsberg, September 2004. Junkerjürgen, R. (2002). Spannung – Narrative Verfahrensweisen der Leseraktivierung. Eine Studie am Beispiel der Reiseromane von Jules Verne, Frankfurt a.M./Berlin/Bern/ Bruxelles/New York/Wien. Mandelbrot, B. B. (1987). Die fraktale Geometrie der Natur, Basel/Boston. Pfister, M. (1988). Das Drama, 6. Aufl., München. Weibel, A. (2008). Spannung bei Hitchcock. Zur Funktionsweise des auktorialen Suspense, Würzburg. Zeitler, H. and Pagon, D. (2000).Fraktale Geometrie – eine Einführung, Braunschweig/Wiesbaden.